A week’s holiday at home always means a trip to visit bookshops in another town, and today it was Truro. Our first port if call was Pydar Mews Books, which has been a wonderful hunting ground for me over the years. Here’s what I brought home today. I already own Rebecca by Daphne du Maurier, but I couldn’t resist adding a numbered Penguin to my shelves. By Love Possessed by James Gould Cozzens was a random book I picked up because it was a numbered Penguin. It’s a story of small town America and there was a very warm endorsement from J B Priestley on the back cover. And another numbered Penguin. Clochmerle by Gabriel Chevalier is, it seems, a much loved French comedy, and that was a good enough reason to pick it up. Amberwell by D E Stevenson was an auto pick up! The Happy Prisoner by Monica Dickens was a lovely find, as I left a copy behind in another bookshop a couple of years ago and regretWhite Ladiested it. I just love her writing. I tracked down a particular edition of Jennie by Paul Gallico for a friend a few years ago – she had borrowed a copy, lost it, and wanted to track down another copy of the same edition but didn’t know her way around the internet- and I liked the look of it, so the next copy I saw I picked up. Today! And another by Paul Gallico: Love Let Me Not Hunger came home because it was a very pretty hardback, and because it was set in a circus and that made me think of ‘The Love of Seven Dolls’ which is a wonderful book. And finally there’s a copy of White Ladies by Francis Brett Young. I’ve read it, I loved it, and I really wanted a copy to keep. There’s a copy in my local bookshop, but I couldn’t justify the price of a signed first edition. This slightly worn, slightly later edition I could. All of those for the very reasonable price of £17.50! I spent my change from a twenty pound note in the Oxfam shop. I’ve just begun reading ‘The Ascent of Woman’ by Melanie Phillips, which is a broad overview of the history of the suffrage movement and I had it on mind to track down a couple of books with a narrower focus. 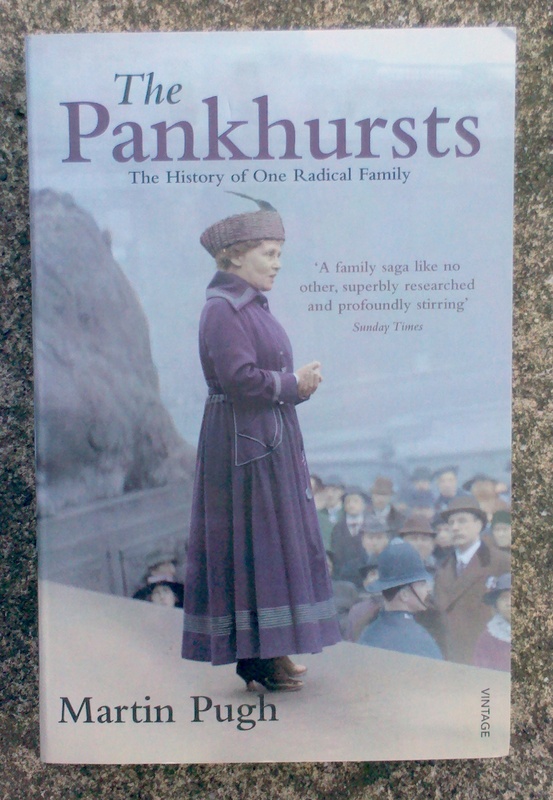 I’m still looking for ‘Rebel Girls’ by Jill Liddington, but I found The Pankhursts by Martin Pugh today. And my fiancé was exceedingly pleased with a signed biography of a fighter pilot and an interesting volume of local history. Nothing much on the other charity shop, but we did one or two other things, we bought my mother a nice new pair of slippers, and we had a very nice lunch at The Crab and Ale House. And on the way back to the car I had a quick look in the library, because the literature collection in the county lives in Truro. I could have picked up any number of books, but common sense prevailed and I just picked up one. 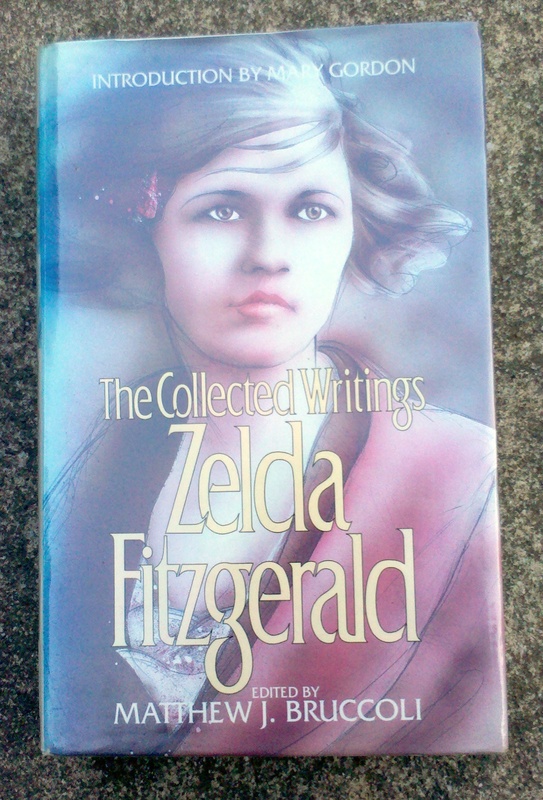 The Collected Writings of Zelda Fitzgerald! Her novel! Short stories! Articles! Letters! I’m really hoping that nobody else orders this one so that I can hang on to it for a while. And that was it today, but before I finish I must mention two books I found locally on Monday. The paperback edition of Gentleman Prefer Blondes was so pretty, it has the sequel – Gentleman Marry Brunettes starting from the other end, and an endorsement from Edith Wharton. 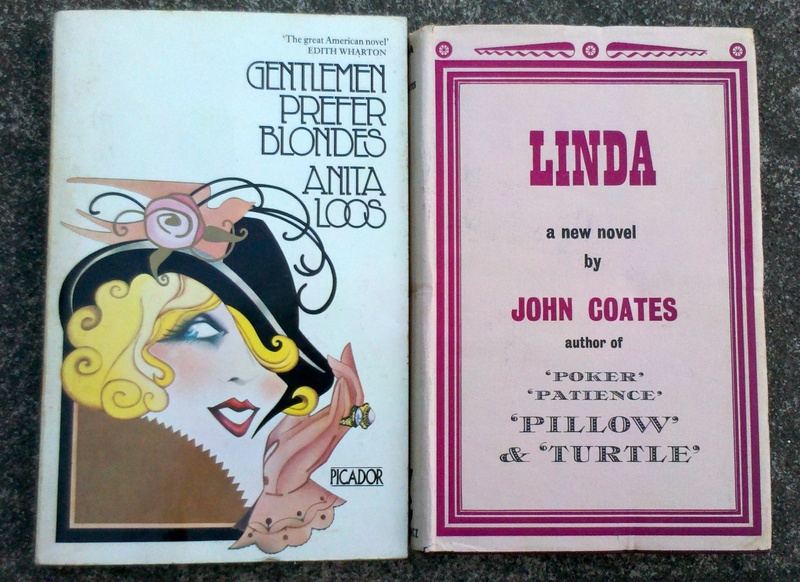 But it was Linda by John Coates that made my heart leap. ‘Patience’ wasn’t one of my favourite Persephone books, but this book is late, the dust jacket describes it as being more serious than his earlier books without being heavy- which might suit me better – and it’s set against a theatrical background. It really has been a wonderful week for books! ‘Linda’ has gone straight on my must find/read list mainly because I like the idea of book with my name. That’s the copy of Gentlemen Prefer Blondes/Marry Brunettes that I have! What a fabulous batch of books! Very jealous of the Stevenson – I’ve yet to come across any of her books in the used bookstores here – and, though I am just starting to read Monica Dickens, I loved The Happy Prisoner. 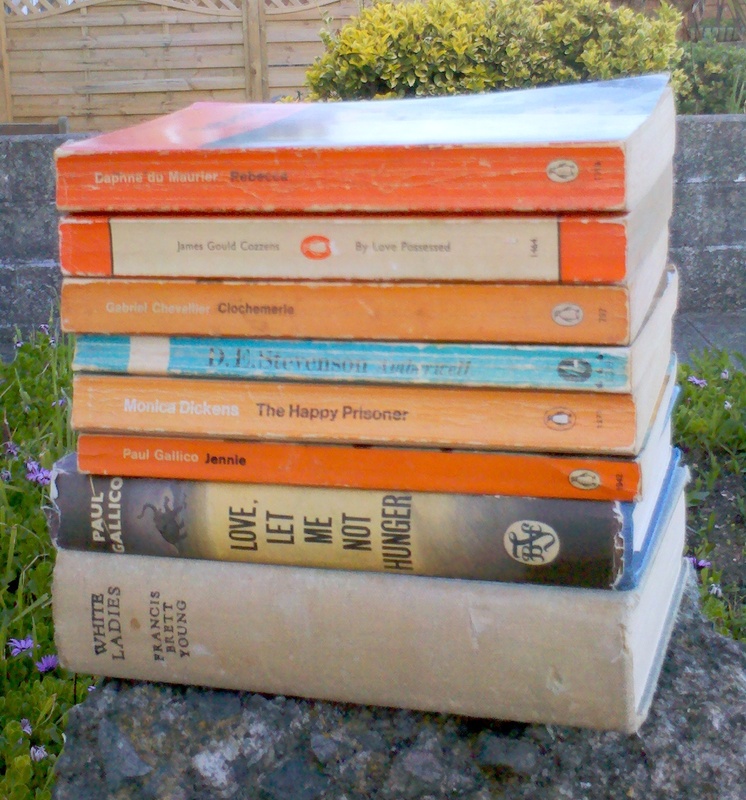 A lovely stack – a great assortment! I hope you have lots of time to read on your holiday. I’m keeping a special eye out for Monica Dickens myself at the moment, but I think I’ll end up with the library or special orders. Great find with the numbered Penguins.I never let a numbered Penguin go astray. Happy reading. Wow, what a fabulous collection, I love the Zelda collection, makes me wish for a whole week of little to do to indulge reading! Enjoy, can’t wait to read more about them. What wonderful finds! And a great haul of Penguins – well done!